(Nanowerk News) Bulky and noisy air-conditioning compressors and refrigerators may soon be a thing of the past. With the latest discovery by scientists from Nanyang Technological University (NTU), current cooling systems which uses refrigerant harmful to the ozone layer could be replaced by a revolutionary cooling system using lasers. 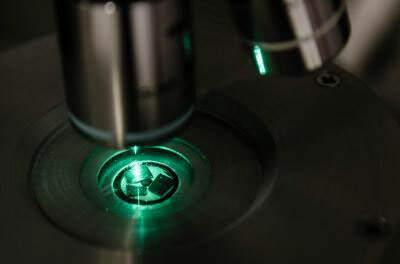 This discovery, published and featured on the cover of the 24 January 2013 issue of Nature ("Laser cooling of a semiconductor by 40 kelvin"), the world's top scientific journal, could also potentially lead to a host of other innovations. This includes making huge Magnetic Resonance Imaging (MRI) machines, unwieldy night vision goggles and satellite cameras - all of which require extreme cooling systems - even more compact and energy saving. This breakthrough in laser cooling technology can even lead to the development of almost sci-fi like computer chips that cool on their own, minimising heat and thus prolonging battery life for portable devices like tablets and smart phones. Assistant Professor Xiong Qihua from the School of Physical and Mathematical Sciences and the School of Electrical and Electronic Engineering had cooled down a semiconductor from 20 degrees Celsius down to minus 20 degrees Celsius. Before this, the cooling of semiconductors by laser has never been proven. The material, Cadmium Sulfide, is a type of group II-VI semiconductor commonly used in solar cells, sensors and electronics. This shows semiconductor material, Cadmium Sulfide, being cooled using a laser beam in Prof Xiong Qihua's experiment. "If we are able to harness the power of laser cooling, it would mean that medical devices which require extreme cooling, such as MRI which uses liquid helium, could do away with their bulky refrigerant systems with just with an optical refrigeration device in its place," Prof Xiong said. "Not only that, but it would also remove the need for compressors and coolants in air-conditioning and refrigerators used in our homes and automobiles, saving space, energy and green house gases which are harmful to our ozone layer. The potential for a compact, cost-effective, vibration-free and cryogen-less cooling system is enormous, as the global market for energy-efficient buildings is estimated to be worth over $100 billion dollars by 2017, according to reports by Global Industry Analysts (GIA). "This also translates into the ability to build miniaturised coolers to cool infrared sensors used in satellites for imaging and build self-cooling computer chips suitable for use in portable devices like tablets and smart phones." Prof Xiong, who leads a research team of 25 people including three undergraduates, is now looking to bring laser cooling down to liquid helium temperature at minus 269 degree Celsius. This is because in principle and theory, semiconductors can support laser cooling down to such a low temperatures. "Our initial results published in Nature, have shown that it is possible to laser-cool a semiconductor to liquid nitrogen temperature, so we are aiming to reach an even lower temperature, such as that of liquid helium," said Prof Xiong, who had directed the research efforts of his researchers Dr. Zhang Jun and Ph.D. student Li Dehui towards this new area. This experiment which took three years to complete was funded by NTU, Prof Xiong's National Research Foundation Fellowship grant and the Ministry of Education Academic Research Fund.